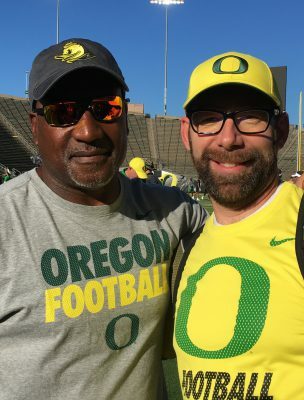 If you missed the inaugural Saturday Night Live July 29 in Autzen Stadium, you missed a great day for die-hard Ducks fans. 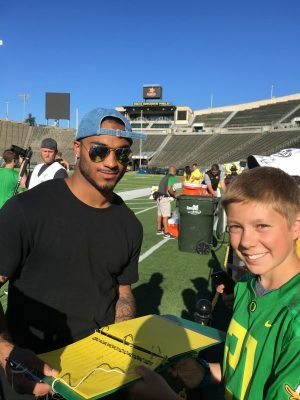 Nevertheless, if you weren’t there, FishDuck.com still has you covered with some recruiting analyses of a few players and some other tasty tidbits. By now everyone has seen the fruits of Oregon’s SNL. Four players committed prior to the actual event that day, with four more big verbal commitments spread out over the rest of the following week. The success of this event has been witnessed across the country. So take note: this staff is not messing around. I drove to the camp from Spokane, Wash., with my neighbor and our two sons and my brother. 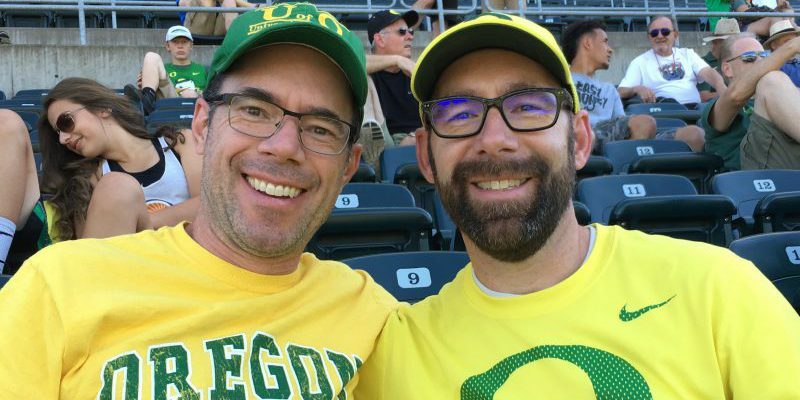 We arrived in Eugene on Saturday morning, and toured the campus a bit as my brother reminisced about his college days in the late 80’s and early 90’s. He showed us the old buildings where he took some of his classes, told us about some of the history of the school, and even told the story of when he serenaded a sweet young thing outside her dorm window. The whole time I had only SNL on my mind. I had lost sleep for several nights, just gearing up to go to this event. I had even had a nightmare about it, waking up in a sweat when I thought I had arrived too late and missed it. Once we finally entered the gates of Autzen I breathed a sigh of relief. We found some shade under the beautiful sunny sky, and I reunited with a high school friend who was there with his lady. 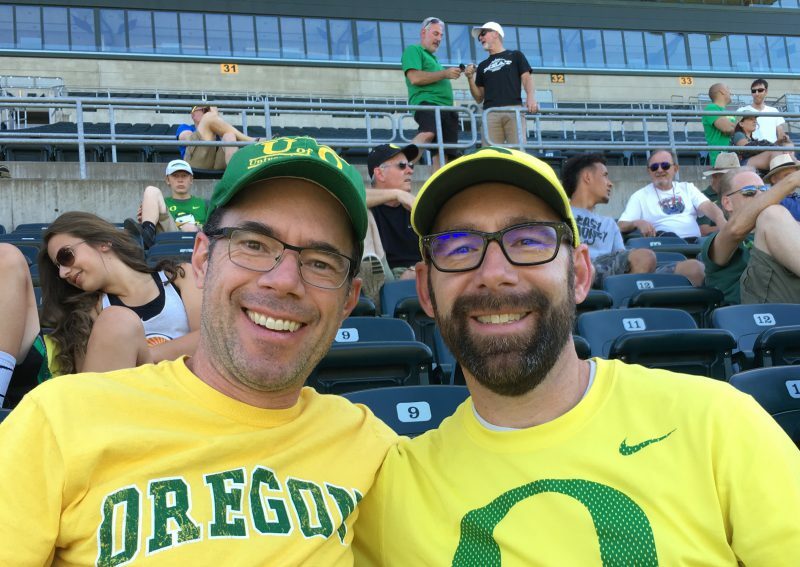 We sat at the 50-yard line, wondering why more Ducks fans weren’t there. There was a palpable energy, though, even with only a few thousand people present. We watched the field, the music thumping as Darrian Felix and Cyrus Habibi-Likio tossed the ball around. When the recruits ran onto the field, the fans stood up and began to clap and cheer. It was awesome! Braxton Burmeister taking time out for a picture and autograph with my son. During the camp, a few of the current players on the roster walked along the sideline, signing jerseys and footballs for the fans. I sent my son down with the autograph folder I had made for him, pointing at Habibi-Likio, and telling him he was going to be a star. He went down, opened up the page with Habibi-Likio’s photo on it, and asked him to sign next to it. As Habibi-Likio was signing, his mother took pictures. I was focusing more on the exercises that were going on. It was hard to see who was who until we got hold of a roster of the 70+ participants. I watched the large offensive lineman Justin Johnson from Pennsylvania, who committed to Oregon two days after the camp. During warmups he had his arms raised above his head, and with each step he demonstrated his flexibility by kicking high enough to tag his hands. Even though Oregon DE commit Jonathan King can play linebacker, he worked out with the other linemen. There was an exercise the big guys did as a competitive race. Two guys would start at the end zone, each running completely around their own large hula-hoop-like ring, then stepping over four or five bags on the ground, next rushing around an upright blocking bag, and finally sprinting straight back to the end zone. King and Malcolm Lamar, who committed six days later, were each so fast that they blew away their opponents. They looked identical with how fluidly they moved, and how natural they looked stepping over the bags. Very athletic big guys like these two will make an immediate impact on the defense. 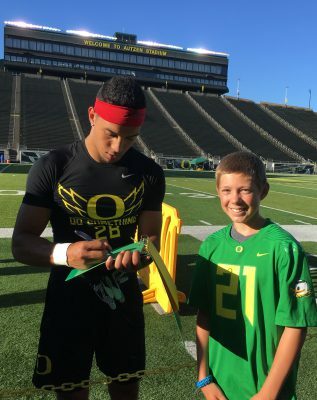 Charles Nelson spending time with fans. I was impressed further by the size and athletic abilities of a few of the tight ends. Oregon commit Spencer Webb ran precise routes, catching everything with ease. Teagan Quitoriano, who committed prior to the event, looked just as sharp. Both are just big, physical specimens — these two are ballers! The small running-back group was four strong; Jamal Elliott wasn’t there. 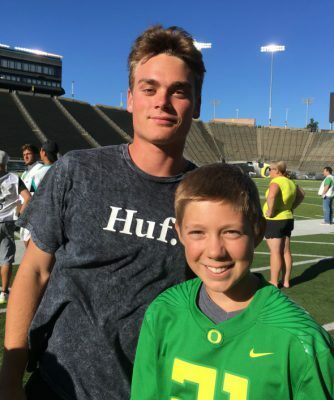 I observed gold-shoed Travis Dye show why Oregon recruited him. He was more polished and smooth in his footwork than the other three RBs, and he easily distanced himself from them. I mentioned to his father later that day how impressed I was with his performance, but dad is used to his sons being underrated. For example, his older son Troy was a 3-star coming out of high school, yet played like an All-American at linebacker as a true freshman last year. The quarterbacks were able to throw quite a bit. They threw to running backs for short routes, but the fun began in the one-on-one drills with the receivers and defensive backs. There were some spectacular throws, with even better receptions at times that got the crowd celebrating. I’m not great at analyzing a QB’s throwing motion or footwork yet and didn’t watch them too closely, so when I saw an amazing pass I didn’t always notice who the ball came from. Mark Dye mingled with the fans while son Travis competed in the events of SNL. Arjei Henderson from Texas committed before the start of the event, and had one particular catch that caused cheers. But when he threw up the “O” with his hands, that’s when the crowd went wild. Henderson recently gained another star on Rivals.com, to make Oregon’s first 2019 verbal commitment a 5-star stud. Another reception caught my eye, but not due to the catch itself. Jaylen Waddle, another Texas wide receiver, made a shifty move and got past the defender as I might get past a third grader. The pass was not exactly accurate, so Waddle had to slow a little, but he was so open that it still wasn’t close as he backpedaled into the end zone. Waddle is very quick, and will cause headaches for any defensive coordinator. Other great catches were made by Braden Lenzy, Isaah Crocker, Tre’Shaun Harrison and Miles Battle, a 6-foot-4 WR from Texas and another event-day commit. After the event Talanoa Hufanga spent time with the fans. Of course, all eyes were on local athlete Talanoa Hufanga, a Scout.com 5-star. He was the only one wearing a bright red band around his head, which made him easy to spot. From what I observed, only two receivers caught a pass going up against him in man coverage. One was a play that he didn’t seem to know was live, as he wasn’t ready when it started. The other was a great, complete play — by the QB, the WR and Hufanga. I don’t know who the QB was, but the WR was 2019 WR Taj Davis. Davis made a great cut and separated from Hufanga. The pass was perfectly accurate, put in a place only Davis could get it. Give Davis credit for having strong hands and making a spectacular snag, because Hufanga closed the gap so quickly that everyone went crazy. I know Hufanga plays safety, and if pads and contact were allowed, things might have turned out a little differently with some of those receivers. But I was really impressed with his closing speed, and how he looked like a cover corner at times. He was on several guys real tight. His kept his balance perfectly, and his hips stayed level and low to allow him to make any directional move. Plus, he caused another crowd frenzy once, when he busted up a play, faced the fans and threw the “O” out in front of him. 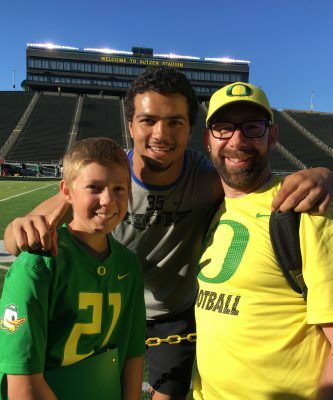 Troy Dye was brought over by his dad to get personal with the fans. Overall, it really seemed as though all the participants had a great time. The energy, the weather, the music, the coaches, the families, the other campers and the fans all made this a very successful camp. I mentioned that Lamar and Johnson committed to Oregon after the camp, but they weren’t the only big guys to do so. 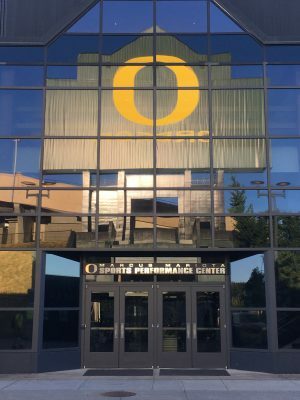 Oregon also received good news from monster offensive lineman Steven Jones from California and Georgia linebacker Andrew Johnson. This class is really filling up nicely, with 22 verbal commitments to date. Never has there ever been a recruiting class like this one for Oregon! Getting 22 commitments doesn’t typically happen until January. And a top-five class as well! Seeing the Ducks go 4-8 one season and still get a top-five recruiting class over the next six months is unfathomable. And the coaching staff hasn’t even been proven on the field yet! What?!? How do you wrap your head around that? Mind blown! The Spring Game and SNL each proved to be very successful at getting prospects on campus in large numbers, and producing serious interest from all parts of the country with multiple verbal commitments. This new staff doesn’t take a single day off, and it shows. The author with Coach Salavea. Yes, you can say it was a good day. When I asked my son what his favorite part of the day was, he replied “Getting Cyrus’s autograph.” I asked him why. “Because he was so nice. 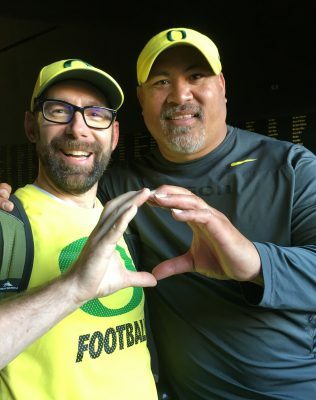 And he reminded me of Marcus Mariota,” he answered. Of course I had to relay this precious info to Mr. Habibi-Likio’s mom. What mom wouldn’t want to hear something like that about her son? With less than two months to organize and prepare for SNL, the level of success was wonderful. I look forward to next year’s event with greater anticipation, because the staff will have a full year to prepare for it. I believe there will be even more interest from many more elite prospects next time as well. I hope next year brings more fans as well, because it’s going to be huge.